AT Last , just one click will buy you this tried and tested Milltek Sport system for the Fiesta MK7 Ti-VCT. 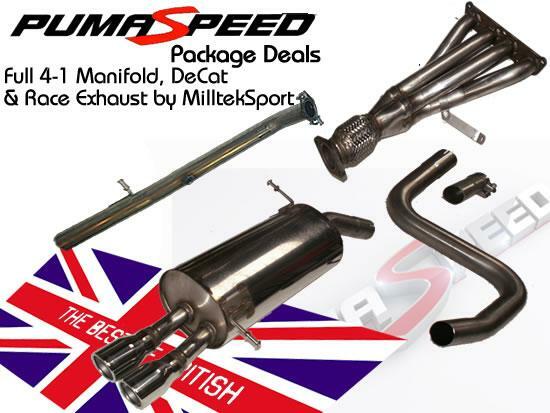 For the last nine years Pumaspeed and Milltek Sport have pioneered the re-introduction of the performance manifold. This new manifold builds on the technology of the 4-1 from the ever popular Mk6 Zetec and the best selling ST150. Now tried and tested on the Zetec SE Ti-VCT engine, this best selling system now comes at a discount Combo price. Complete NO COMPROMISE solution giving unbelievable power and torque increases. What power will this give my Fiesta ? Please Note - De-Cat Pipes by their nature of removing the catalytic converter will render the car incapable of passing the UK. emission test which forms part of the annual MOT test. The Pumaspeed Workshop team are ready to fit the Fiesta Mk7 T-Vct Miltek Manifold & Race System PACKAGE DEAL in our Head Office located here. We estimate the labour time to be approximately 3.50 hour(s) costing £273.00 inc VAT. Therefore making parts and labour a total cost £1,033.99 (inc. VAT). Pumaspeed have a specialist distribution team that can dispatch the Fiesta Mk7 T-Vct Miltek Manifold & Race System PACKAGE DEAL to any destination worldwide.